Joe Karson, of course, invented the famous "Zombie" floating ball, but there was quite a bit more to Karson than just that. The ebook is divided into two main sections; Karson's biography and Karson's creations (books, tricks and commentary). It has 29 photos, most not seen in many years. Besides extensive research in New England public records, several people who knew Karson were also interviewed, both magicians and laymen. Some of the well known magic personalities interviewed were; John Calvert, Jim Cellini, Ray & Ann Goulet, Jay Marshall, Sidney Radner, Nick Ruggiero, Les Smith, Tony Spina, Ben Stone, Parker Swan, and many others. 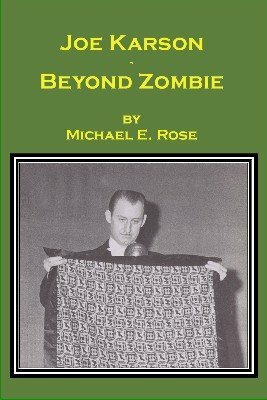 The book also features a Foreword by Lance Burton, one of the most famous "Zombie" workers alive. 1st edition 1999, limited to 500 copies. 2nd edition only electronic with corrections and more photos 2006; 212 pages.